Hello dears, sorry I missed my post yesterday but LO took a long nap in the afternoon and then refused to go to bed at her usual time last night. Despite that I did have a great day with her because I had the day off, and then later we went to dinner at a new vegan restaurant. The food there blew my mind, and as a meat eater married to a born and raised vegetarian, I've had quite a lot of veggie foods in my day. They served bbq tempeh and "sausage" pizza that DH and I split, and I had their grain salad which came with tempeh, kale, and their blend of grains. Delicious! I can't wait to go back - and I've never said that before about a veggie restaurant! During Enchanted's April restock I was quick enough to score a polish from her new Time to Pretend collection, The Youth. I'm not too familiar with the namesake of this collection, which is the band MGMT, but the polishes are named after their songs. The Youth appears to be a green hued holo that turns silver in some lights and can be considered to have a duochrome effect. I used two easy coats for this mani and found that it dried fairly matte, so I added a layer of Poshe to add shine. It seems weird to have unshiny rainbows, and unfortunately I think the Poshe dampened the rainbows a tiny bit. 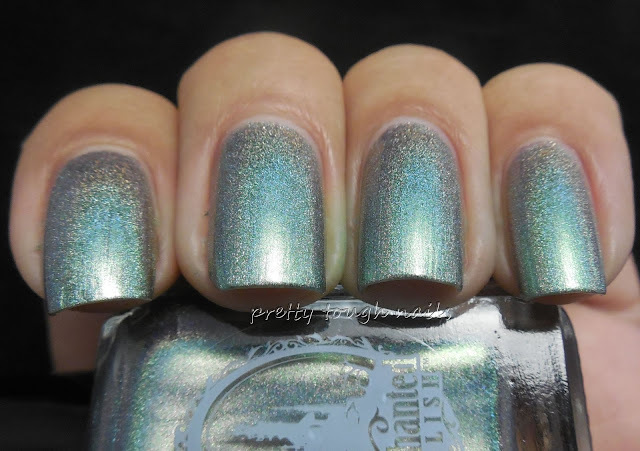 These first set of pics are in my light tent, so you can see the actual shade of the polish. There's still a little bit of holo effect even under this lighting. Next, under direct light where the rainbows really pop. It's hard to capture the green shift in color, but you can sort of see it in the fourth picture below. 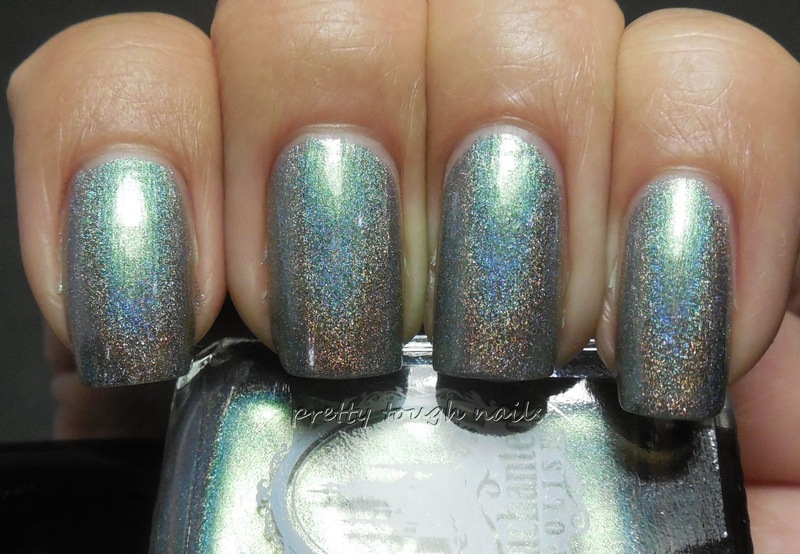 I love wearing holos now that it's summertime, but as a born and raised East Coaster, I keep forgetting about Los Angeles' June gloom. Boo. Here in this city, the entire month of June is cloudy in the morning and burns off sometime in the afternoon. I'm sure there's a scientific explanation but alas, it's not going to make my holos shine. I wish I could see the rainbows all day with The Youth - its duochrome finish makes it a really unique polish to add to my collection. Do you know of any others out there?